Another destination, another WOW. With 25 ships sailing to destinations including the Bahamas, Caribbean, Mexico, Bermuda., Europe, Asia, Alaska, Australia on 3, 4, 5, 6, 7 night and longer voyages, all you have to do is pick a spot and go. Our fleet is designed to bring you the best in dining, entertainment and activities so that one WOW leads to another and another and another. GIFT DEVICES MUST BE REDEEMED DIRECTLY THROUGH ROYAL CARIBBEAN INTERNATIONAL® for the U.S. dollar value as outlined on the face of the Gift Device. •	Gift Devices must be used as a form of payment towards a reservation made directly with Royal Caribbean and NOT through a Travel Agency. •	Gift Devices may not be applied to a group reservation. •	A deposit is required at time of booking. •	Gift Devices can be used in multiples and may be used to supplement cash payment or credit card. •	All reservations are subject to availability. 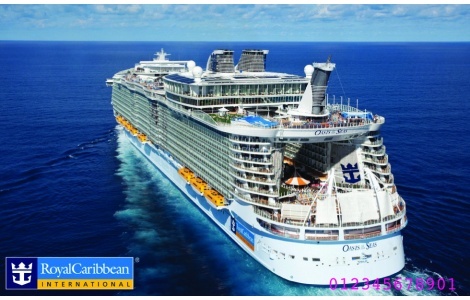 •	Once a reservation has been made with a Gift Device, Royal Caribbean’s normal cancellation policy, schedules for deposit and final payments shall apply. •	Gift Devices are transferable only when gifted and bear no expiration date. •	Gift Devices shall be void where prohibited or restricted by law and if sold for cash or other consideration.